California’s most influential and effective voter registration effort, the African American Voter Registration, Education and Participation Project (AAVREP) has launched a massive 50,000-person statewide voter registration drive (named WokeVote18) for the 2018 election cycle. Now led by former Assemblyman Sebastian Ridley-Thomas as its Chief Strategist, AAVREP is continuing the legacy of voter empowerment through the electoral process. “We often hear talk of party appeals to ‘the base.’ But Black women are not just the base of the Democratic party — they are the backbone of our Democracy. Democracy is at stake and Black people will save California and the nation, if they register. And when they vote they will have the same impact as the Black women in Alabama, Virginia, and New Jersey. AAVREP is all in to grow the ‘Woke Vote’ in 2018,” said Sebastian Ridley-Thomas. Founded 16 years ago by Los Angeles Supervisor Mark Ridley-Thomas, AAVREP has registered over 230,000 voters up to present according to the Los Angeles County Registrar of Voters and California Secretary of State. Supervisor Ridley-Thomas, Congresswoman Karen Bass, Assemblyman Reginald Jones-Sawyer, Los Angeles Councilmen Marqueece Harris-Dawson & Curren Price, SEIU Local 2015 President LaPhonza Butler, SEIU Local 99 Treasurer Tonia McMillian, Lee Wax of AFSCME Local 685, Charles Drew University President David Carlisle, Los Angeles Police Commissioner Cynthia McClain-Hill, Los Angeles County Board of Education Member Alex Johnson, businesswoman Jamarah Hayner, and Apostle “BAM” Crawford of Bible Enrichment Fellowship Church led a crowd of change agents ready to increase African American voter turnout. The African American population in California is only about 2.2 million people and election data shows that African-American voters have an outsized impact on election outcomes. This is in large part due to high rates of participation by African American women in local, state and national elections. In both 2008 and 20012, black women made history, voting in national elections at a higher rate than any other demographic in the country. For AAVREP, mobilizing the African American vote means empowering Californians to insist government address the community’s top priorities: maternal and infant mortality, access to health care, substandard schools, a lack of educational opportunity in black neighborhoods, housing, and of course, constitutional policing. Although the focus of the drive is on African American voter registration, the project has always, and will continue to, registered voters of other ethnicities. “We aren’t going at it alone. 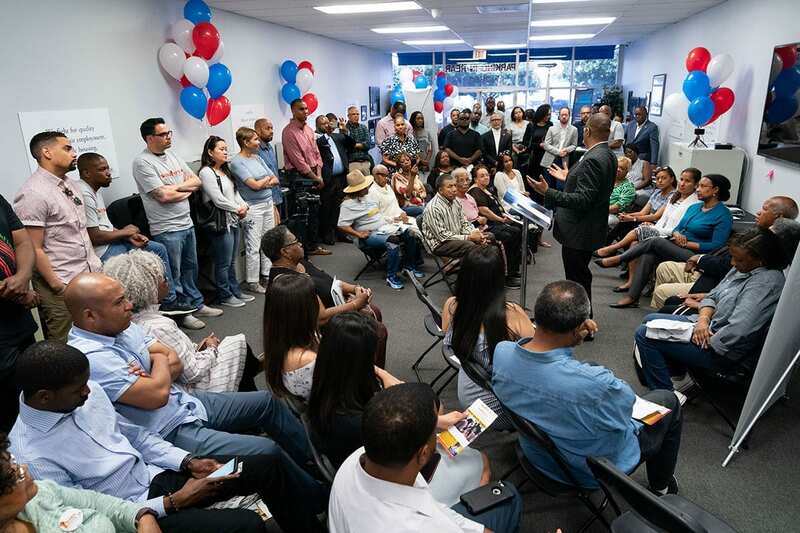 The strength of the African American vote helps power our alliances,” said Assemblyman Jones-Sawyer, noting that poor people and people of color share many of the same concerns. Additionally, the group has partnered with community organizations to conduct extensive focus groups and polling of African American voters in state and local elections, strategically deployed resources to hundreds of precincts to educate, persuade and turnout African American voters in local and statewide elections. “Registering tens of thousands of voters, will be a massive undertaking. It is a labor-intensive, grassroots project that requires neighborhood-by-neighborhood, street-by-street, door-to-door engagement,” said Councilman Price. WokeVote18 is located at AAVREP Headquarters 3653 S. La Brea Ave LA, CA 90016 near the intersection of Rodeo Road and La Brea Avenue in the Crenshaw District. Those interested in participating in the voter registration drive should visit the office, the website at www.aavrep.org, or call 323-903-5542.